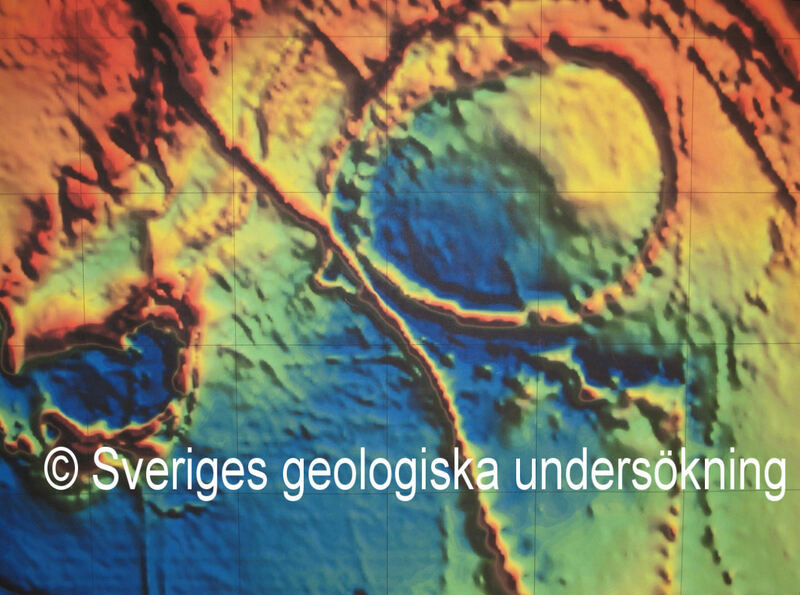 In November 2005 the Geological Survey of Sweden published several geophysical maps of the region north of the village Särna in the county of Dalecarlia. Three of these maps show a round structure, a ring of deviating magnetic field and electric resistivity. The difference of the geomagnetic field between the dike and the inner parts of the ring is from 50200 to 50700 nT. Already in 1923 N.H.Magnusson, who has investigated the alkaline rocks of Siksjöberg and Ekoråsen /1/, supposed a similar body of rock to the East near the border to the county of Härjedalen. Therefore this author started a field-investigation. The result of this investigation proves Magnusson’s suspicion, that the approximately 100 m wide ring-dike consists of rocks of the feltspathoidal syenite family and thus is related to the intrusion of Siksjöberg and Ekoråsen. 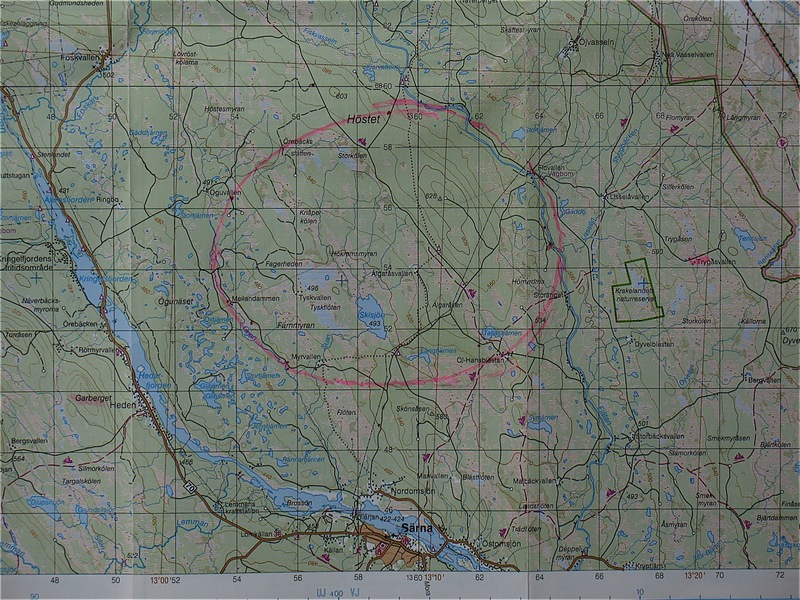 The centre of the ring structure is at the coordinates 135900E/685500N, which is about 9,5 km north of Särna Church. The ring is in fact an oval with its western border at coordinate 135300E, the eastern at 136500E, the southern at 685000N and the northern at 686000N, see Fig.1. Along large parts of the perimeter the dike is easily seen in the terrain; on the western side the small stream Ögan uses the dike as its bed as does the stream Fjätan on the eastern side.These two watercourses surround the oval by approximately 180˚. Of course only parts of the streams total length uses the dike as their bed. On the other half of the circle the ring dike is not so evident; however, knowing where to look, signs of it can be found in the terrain, e.g. at (Pos. G and H). The sites investigated are named clockwise around the structure; their coordinates are given in the Appendix. The whole inner part of the oval is almost free of outcrops; the only one found is the top of the unnamed hill 626 m high in the right half of the oval. The visible top of the hill consists of porphyries. Inside the oval the till, consisting of porphyries, does not show the rocks which are peculiar to the dike. Therefore the conclusion can be drawn that the bedrock inside the ring-dike consists of the local porphyry. The dike – where visible – forms a 50 to 100 m wide trench in the terrain. This is best seen from (Pos. C and D) near Ögan; at (Pos. D) there is a timber deposit on the inner side of the oval. There the trench is filled to an unknown depth with glacial deposits, on which rests a peat bog; the river cuts into and meanders within this peat bog. Both sides of the trench are steep; on its outer side at (Pos. C) there is a cliff which – due to the stream Ögan - is inaccessible from the trench’s inner side. The best place to measure dip and strike is at the bridge over the stream Fjätan, (Pos. I). There, immediately at the bridge, the bare rock shows vertical (along the dip) gliding striae. Evidently the magma, rising in the ring, came in different rushes, new cone sheets slid along older ones. About 100 m upstream there is another outcrop which shows the complex pattern of cracks of the dike-material. Pleistocene certainly aided the erosion of the deep valley, in which the stream Fjätan now flows. All sites are very near the ring dike, see Fig.2. This outcrop is outside the ring; it is situated on the western side of the road from Nordomsjön to the oval. Here the rock consists of a light grey porcellaneous mass containing well-rounded quartz grains. This outcrop also shows up on the geomagnetic map. The grey mass looks like welded-together grains of a mineral, which contains some grains of pyrite. Most probably the original material has been nepheline, which on the way up from a magma chamber absorbed quartz grains and consumed them to form the observed structurless alkali feldspar. In macroscopic terms the feldspar is completely amorphous, has no cleavage and no lustre. The outcrop is on the western side of the road; on the eastern side the forest has been cleared and the soil ploughed. Since this site is south of the dike it is easy to find ice-transported rock fragments from the dike there. Here blocks of a yellow to orange feldspar are seen, which gradually merge into a moss-green rock. The rock is an alkaline feldspar, appears like a solidified melt; no cleavage is seen. Other blocks have a flow-banded texture. (Pos. C) Outcrop at the stream Ögan. This point is about 100 m south of the forest road, quite near the ring dike. Here two outcrops of basalt are seen. In a sample aegirine can be seen with the naked eye; the analysis confirmed this. The basalt is quartz-free and weathers to a brown colour. It consists of plagioclase, ilmenite (about 10%), magnetite and augite/aegirine. A steep outcrop, forming the outer side of the ring dike, is seen on the other side of the river. At the timber deposit there is weathered quartz-free basalt, containing the mineral aegirine, plagioclase and ilmenite. This is a larger gravel pit, quite near the western side of the dike. Here a block of basalt, equal to that from (Pos. C), with large sheet-like and twinned crystals of ilmenite, and blocks of the orange dyed amorphous feldspar, have been found. Also a block of tinguaite with large inclusions of calcite and large sheets of biotite has been found. However, this block has nothing to do with the investigated cone sheet. Here at an empty lodge for log-drivers, the ground on the ring-dike is bare and many local rocks can be collected. A block consisting of the orange feldspar (melt) admixed with a green melt can be seen. The contrast between the two melts is much sharper here than in the sample from (Pos. B). In the sample from (Pos. F) it is probable that two melts have met. Knowing where to look the ring dike is found here at the expected position. Rich vegetation impairs finding of dike samples. On the forest road NE of Storkölen at (Pos. H) on the eastern side of the road some water-filled depressions are seen. This is the remainder of the ring-dike. No sample taken. On both sides of the dike there are accessible outcrops with strike 32 to 38˚W and dip 45 to 70˚. Here the outer side of the oval is easily reached. The rocks clearly show that there must have been different intrusions, the different sheets must have slid along one another. Two types of rocks are to be found: The first type is identical with the grey feldspar from (Pos. A). The other type consists of orange feldspar, with rounded quartz as inclusions. Also a weathered mineral-like ore, goethite, is present in cracks in the latter sample. At least two different systems of cracks are present. This is probably the deepest (most eroded) part of the ring dike. On the bed of the stream a block was found, consisting of approximately equal parts of albite (cleavalandite) and aegirine, with a substantial amount of rutile. All three minerals have crystalline shape. This clearing is ploughed and exposes many different rocks from the area. There a deep-red ‘porphyry’ has been found, which is very rich in several mineral fragments (albite, quartz, copper-red burned mica and a grey-black ore). The mineral grains are rugged; often single grains are cracked and penetrated by the groundmass. The texture (rugged crystals and burned mica) resembles more the soevit of astroblemes. It could be that this ‘porphyry’ is the product of the crushing at depth of the bedrock by the rising alkaline magma. Mica does not normally exist in porphyries. A profile along a diagonal SW to NE through the ring from Mellandammen (Pos. F) to Flovallen (Pos. I) is given in Fig.3. It is perpendicular to a depression (not seen in Fig.3), running NW to SE from Storkölen in the north to Ol-Hansblästan in the south. It could be that this depression between two parts of the oval is a fault, which occurred during the lifting of the whole area. Only the eastern part has been lifted; the western part slid back. However, on the geomagnetic map there is no indication of an intrusion of the alkaline melt along the suggested fault, as in the ring dike. Here, along large parts of the supposed fault, is a depression filled with a peat bog; this prevents the inspection of the underlying bedrock. The geomagnetic map indicates, too, that the field is higher in the eastern half of the oval than in the western half. The border between these two regions coincides with the supposed fault. 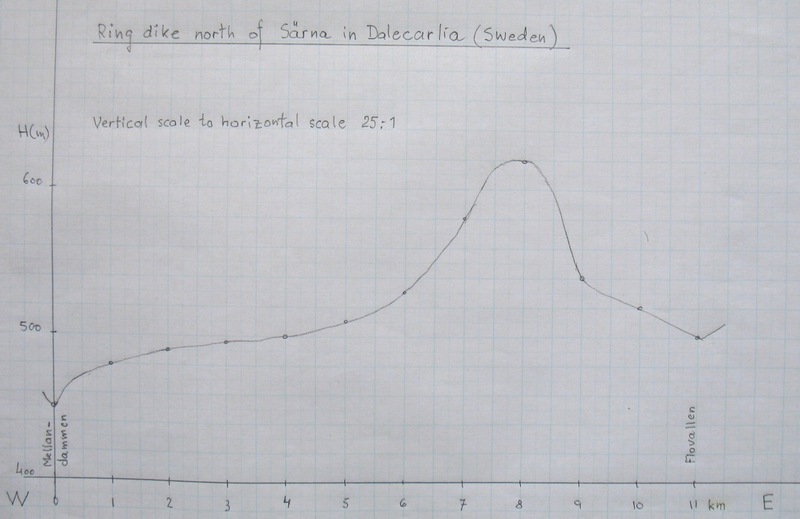 An alkaline ring dike containing minerals of the feldspathoidal syenite family has been discovered north of the village of Särna in Dalecarlia county. About 10 km to the west of the western border of the oval there are two extrusions of this magma, forming the hills Ekoråsen and Siksjöberg. At both these sites nepheline occurs in the outcrops. In the ring dike we have not yet seen nepheline, but several minerals, belonging to the feldspathoidal syenite family, e.g. aegirine, rutile and ilmenite, are present. The measured dip of 45˚ allows an estimate of the depth of the former magma chamber to 4 km. From Trygåsvallen, about 15 km NE of Särna, which means 3 km E of our ring-dike, finds of large blocks of tinguaite have been reported /2/. These cannot have reached that point by ice-transport from Byggningeåsen or Garberget, where, on both sites, tinguaite has also been reported. Therefore dikes of tinguaite, emerging from a local body of magma, have to exist even east of the river Österdalsälven. This, together with the existence of the outcrops at Ekoråsen and Siksjöberg, is a very strong indication for the existence of a common magma body below the area. The lack of nepheline can possibly be understood from the genesis of the dike: Nepheline-rich magma rose from about 4 km depth along a thin ring-dike and reacted on its way with quartz to form alkaline feldspars. By the same token a narrow ring dike could be enriched with interesting minerals like rutile and others. The author of this paper would like to express his thanks to Riksmuseum in Stockholm and to the museum’s docent Henrik Skogby for support and analyses of many samples.